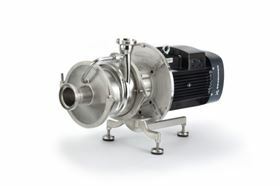 An example of one of the new range of Grundfos GHP hygienic pumps. A new self-priming pump has just been introduced to the Grundfos hygienic range - the GHP. These stainless steel single-stage pumps are based on the company’s HILGE technology and build on the best features of the F&B-HYGIA end-suction pumps. These pumps can handle liquids with high air content, as is required in CIP return systems (they meet QHD standards). This means they can be used for product conveyance as well as for cleaning processes. They also feature a new hydraulic technology that allows the impellor to be adjusted to accommodate an exact duty point requirement which, Grundfos says, improves the performance and significantly reducing noise levels. Bornemann SLH twin screw pumps are single-flow and self-priming.